Northumberland is in the running as the Best UK Holiday Destination at the prestigious British Travel Awards 2018. Having gained silver for the last 4 years, thanks to public votes this year we really want to go for gold! Whatever your favourite type of landscape, you’ll find it in Northumberland. As you seek it out and enjoy its wonders, you’re unlikely to be among hordes of other people doing the same. • Northumberland is the most remote and least populated county in the UK. • The Breamish Valley with it’s high rolling hills and lovely river setting make it a perfect location for picnicking or for walking. On the hills are remains ranging from Neolithic and Bronze Age burials to hill forts, farmsteads, field systems and deserted medieval villages making it an important archaeological landscape. • Northumberland has many great cliffs that give outstanding views. The Cheviot stands at 815 metres, on a clear day you can see as far as the Lake District and even, some claim Edinburgh. • The Sill is the UK’s National Landscape Discovery Centre at Once Brewed the exhibition brings our incredible landscape to life. • Hadrian's Wall was built on igneous rock in Northumberland. The line of igneous rock found here is a sill, formed 295 million years ago when magma cooled within the earth. Over time, the less resistant rock surrounding the sill became eroded, leaving a higher ridge of land perfect for defence. 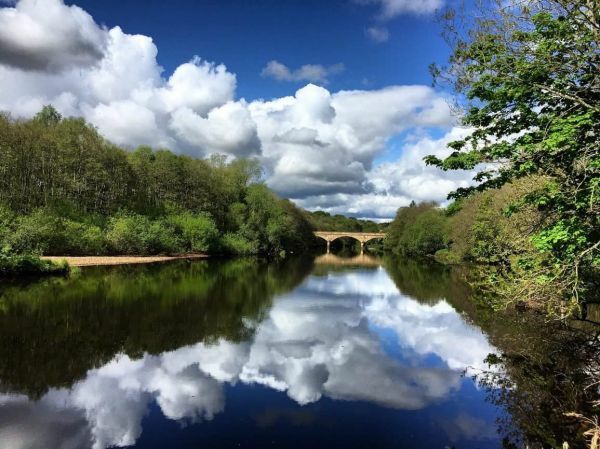 • Many visitors to Northumberland enjoy the great outdoors when they camp – truly getting back to nature. • From relaxed family ambles to challenging long distance hill and moorland trails, Northumberland National Park boasts more than 600 miles of marked footpaths and bridleways within the 400 square miles of landscape.